Having always been admired for their beauty and rarity, coloured pearls may be counted amongst the rarest of gems. Amusingly, ancient civilizations held the somewhat poetic belief that pearls were formed from dewdrops. They maintained that white pearls resulted from creation in fair weather and darker ones from cloudy conditions. Contemporary gemmologists put forward a more scientific theory:that the colour derives from that of the shell in which the gem is born. The oyster producing most of the dark coloured pearls is the Pinctada Margaritifera. It is best known for its black, dark grey and gun-metal coloured pearls, which all vary slightly from silver to black with wonderful green, pink, purple and gold overtones. Black pearls became particularly fashionable following the years after 1845 when pearls from the Tuamotu Archipelago and other South Sea islands appeared on the market. This fact, combined with Empress Eugénie's, wife of Napoleon III, penchant for the black gem, brought them into vogue. 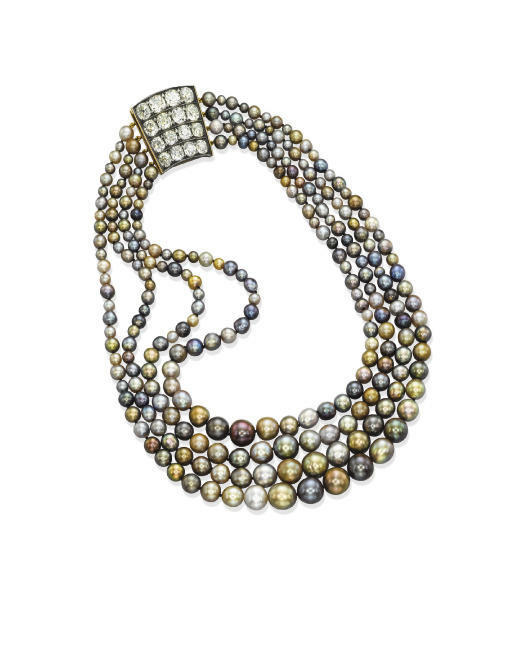 She had a beautiful selection of fine black pearls, including a superb necklace, offered for sale at Christie's historic sale of 1872. The trend thus spread to other European courts. One of the most impressive black pearl necklaces belonged to Empress Elizabeth of Austria ('Sissi'), considered the most beautiful woman in Europe. It was set with thirty pearls and weighed 1,040 grains. In Russia, Catherine the Great owned a black pearl necklace that subsequently became the property of Princess Tatiana Youssoupov and was later acquired by Lady Deterding.